Walking into the Wave Pool art gallery, temporary home for The Welcome Project, I was greeted by a flurry of activity. Sheryl Rajbhandari, her mother Shirley Richards, volunteers, and a group of refugee women meet there every Monday through Thursday for what they call “girl time.” Everyone is happy, laughing, and smiling as they participate in the week’s sewing project, creating passport covers for the Pasaporte Program, which processes passport applications for children who are unable to do so themselves. You can feel the camaraderie, even though many of the women don’t speak English. 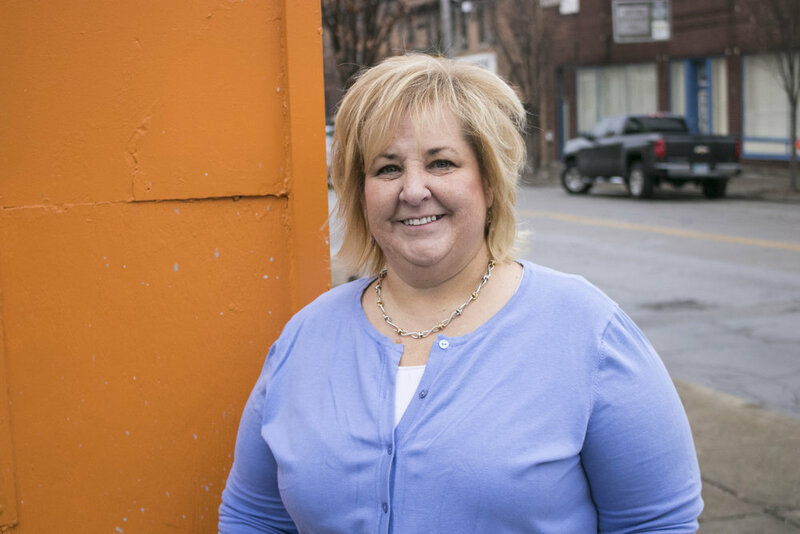 This all began with Sheryl, founder and executive director of Heartfelt Tidbits, a nonprofit that provides support and services to recently settled refugees and immigrants in Cincinnati. We sat down with her to learn more. Interview by Heather Churchman. Photography by Chelsie Walter. You were in the for-profit world when you founded Heartfelt Tidbits in 2010, and for two years after that. How did you decide to make the leap from helping refugees part time to giving up your job? These refugees don’t have an underground freedom museum sharing their story. So what happens to their kids? Some of the kids, too, were starting to forget that they had even been in a refugee camp, because they came here when they were so young. We had 28 students in that English class at the time, so we used the grant money to bring in a translator and document each one of their stories. So they said, “Just take the combination of the first part of our stories, of how we left Bhutan and ended up in Nepal, and then just write about some of us.” So I selected four stories and published those in the book, and Sarah did all the photography. At that time, it was so hard to write their stories that I was like, “What am I doing? These people have been through more hell than I even thought.” It took over a year to write the book. It took a month to write some paragraphs because they were so sad that I just had to put it down. I told my husband, “We can make such a difference if I focus on this. Right now, I’m doing them an injustice; I’m living in both worlds [full-time work and volunteering]. I’m throwing a lot of money and convenience at them, but I’m not really teaching them to live their lives independently. The more refugees we have, the harder it’s getting to support them. They’re everything, and I can’t be everybody’s everything [while working full time].” But if I stopped working full time and started running this as a business, then I could start engaging other volunteers and resources, and it would force me to go get partners. 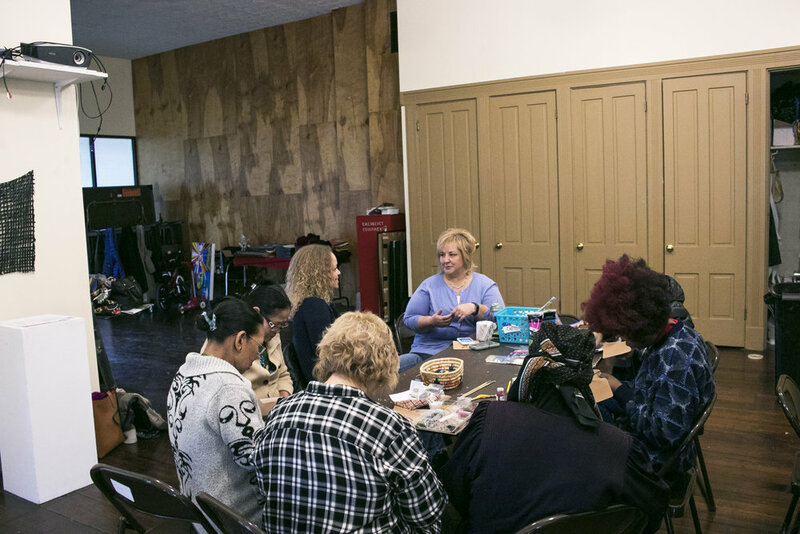 I said, “We need to expand their world, and right now, it’s just us and a few volunteers that were helping with English classes.” We really needed more people to be “their everything” like we were. Give us a brief outline of your partner project with Wave Pool, The Welcome Project. The Welcome Project, social enterprise, which we just call Welcome, has three main components: Welcome Home (online and storefront), Welcome Creativity, and Welcome Editions. We're still working through the details and name of Welcome Home and Welcome Creativity. Welcome is the space itself, next to Wave Pool. Due to construction, Welcome is currently closed and our existing programs are being held at Wave Pool. We are eager for the construction to be complete so we can move our programs and items for sale back to the space. 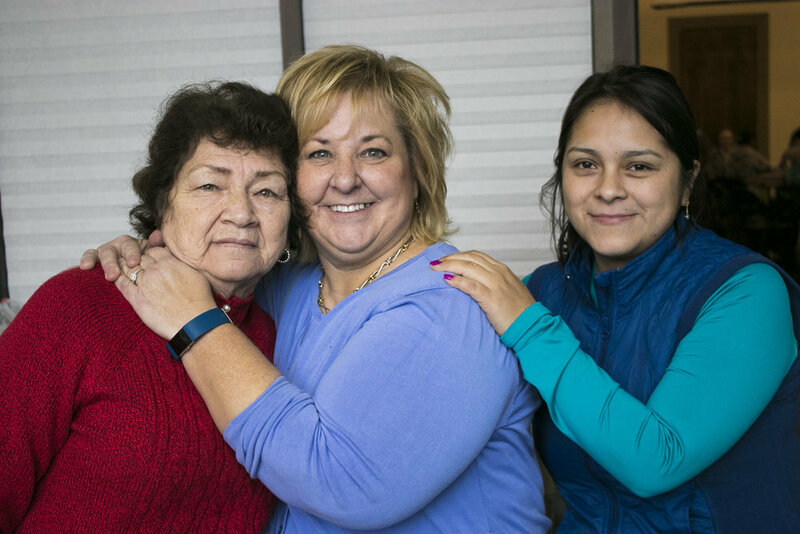 The refugee and immigrant women who are part of Welcome have been driving the decisions and direction of Welcome. The classes they have taken, along with the gifts they bring from their homelands, have allowed them to earn income and create different products that will be sold out of the storefront, both for income and for funding the Welcome Project. We want Welcome to have an emphasis on building and engaging community, employing refugees, and teaching them skills. 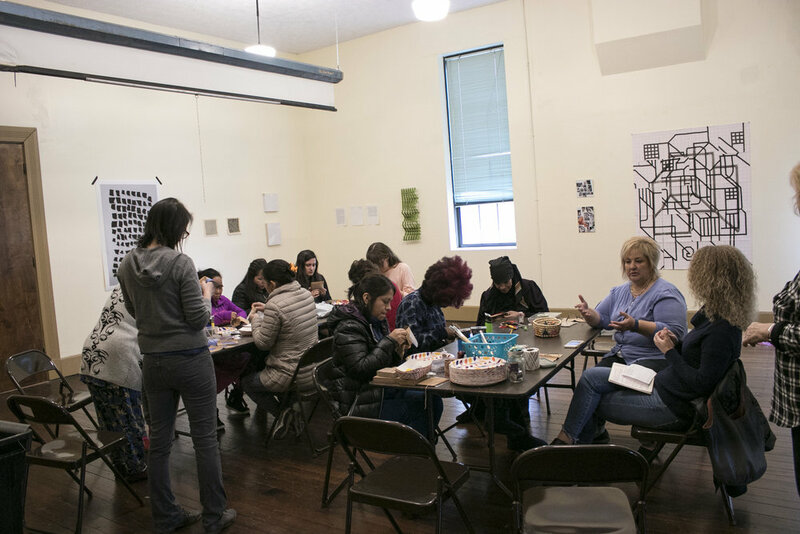 A few of the ladies are being mentored and have led workshops for fiber, cooking, and sewing. Lourdes, another student who has prior business experience, is learning the operations and management portion of Welcome. We're working with a Syrian woman, Warda, who had a tailoring business in Syria, on how to launch and expand one here. Welcome will have a kitchen space, which, like the shop, will serve as a workshop area and have a few staples for sale. The women from Welcome can hold workshops to teach the community how to cook their ethnic dishes. Local neighbors will learn how to utilize the produce being grown in the nearby Welcome Community Garden. The Haile Foundation provided startup funding for Welcome Editions, which is Cal’s initiative. [Cal Cullen is founder and director of Wave Pool.] Welcome Editions engages nationally known contemporary artists to create art that the women from Welcome can be paid an hourly rate to make. The items are then sold and marketed to art lovers, galleries, and through our Welcome Shop. I've heard that if you know someone for any length of time, they end up volunteering. How do you make those connections with people? Sheryl: [Laughs.] Yes! Angelie, she’s a volunteer – a fairly new one. What made you volunteer, Angelie? Angelie: I’ve been interested in human rights for a long time. The current context made me even more interested. Then I heard a lot about what Sheryl was doing, and how could I not get involved? Angelie: I was intimidated at first, but then you get here, and you realize, this is heaven. Sheryl: And it is, because it isn’t about me leading anything. I can get busy. It’s really the ladies and what they do among themselves, the camaraderie, and the support they give one another. Some of our volunteers are completely alone, whether their families have passed away, they’ve retired and lost their spouses, or their kids are gone, so for them, it’s as much a social thing as it is for the refugees and immigrants. I had no idea Cincinnati was home to so many refugees. How does that happen? Over 20,000 Bhutanese people have arrived in Cincinnati since 2008 – probably closer to 25,000. Looking at how many resettle in Cincinnati holistically through Catholic Charities, the number is about 200 per year. In 10 years, that’s 2,000 people. So how do we end up with this many? Sometimes, refugees are relocated to other cities, but Cincinnati has been such a successful hub for refugees, that they started moving here. These “secondary migrants,” as we call them, have no support. They move here on their own, they just show up, and have no help. How do you think you became so observant of people, and noticing people in need? Are you a questioner? Or do you think people just feel like they can open up to you? How do people find you, or how do you find them? Do you ever get overwhelmed? All the time! Not overwhelmed with the people; it’s more the bureaucratic stuff, the political side, dealing with the partners who don’t share information. The frustration of meeting somebody when they’re completely… like a physician said to me recently, “The only person to call in extreme cases is you. No one else cares. I call [people other than you] and they go, so what? Not our problem.” So the hard cases come in and… it’s frustrating. And we don’t have a staff. No one in our organization is paid, including myself. There are plenty of organizations that do have a lot of money, with social workers, with trained mental health folks, and then I think, “Wow, here I am, a computer science major with an MBA, doing social work.” Sometimes I question if that’s always a good thing. Angelie is a professor of psychology. I told her, “I’m so happy to have you as a volunteer because I feel like sometimes I need a professional opinion.” We have friends who are physicians that I’ll call, and say, “Can you attend this program?” I can get concerned that I’m not making the right decision. Who is an influential woman in your life? Of course, your mom is always influential, right? And she’s sitting right here with us. She raised me, so of course she had a lot of influence. She has been an advocate of this work I do, and has embraced it from the beginning. Other women that have influenced me are the refugee women themselves, and the immigrant women – the strength that they have, and the leap of faith they take to flee a country. I’m amazed by that every day. I can’t even imagine it. I ask them a lot of times, “What made you go on?” And they always tell me, “It’s God, or hope of our family.” They say to me, “You’d find the strength to do it.” But honestly? I don’t think so. It’s unimaginable. We complain… As my husband always says, “We define things as first, second, and third world problems.” 98 percent of ours are first world problems. The heat isn’t working. That’s a first world problem. These women didn’t even have electric. They couldn’t turn on a TV. They didn’t even know there was a war happening in their country. The same thing in Bhutan. They had no idea there was an ethnic cleansing coming until an army hit their village. Until they saw the first person burned alive. Then it was very apparent: We need to leave. Then I think about, “How do you choose what to leave behind? What do you pack? What’s important?” The stuff they did take, they moved it to a refugee camp, and then watched the camp get burned to the ground. It’s horrific. Have you thought about that for yourself? What if there were a fire at your house; what would you take? Oh yes. I think it’s changed the way we live our lives. If somebody walks into your home and says, “Wow, I love that painting or I love this,” give it to them. Unless you’re really in love with it, give it to them right then so somebody else can enjoy it. Because all that material junk you have, is gone in a minute. What would you say to someone reading this who wants to get involved? Most importantly, look around in your neighborhood. When you're shopping at a grocery store, become aware of who’s in there and what their needs may be. We had a gentlemen who was stuck at Kroger for something like 10 hours. He had no way home and it was pouring rain, so he was waiting for the rain to stop. Prior to helping refugees, I was always offering people rides, whether it was downtown or in my own neighborhood. I think just being more compassionate to human beings, and observant. That single mom who is pushing her kids and the kids are screaming... maybe stop and entertain the kids a minute so she can get her shopping done. Many of the refugees and immigrants take the bus, and I often hear, “I tried to talk to the person sitting next to me and they wouldn’t talk to me.” I encourage them to speak to every American they meet because it’s an opportunity to practice. So if somebody does speak to you with an accent, maybe just take a few minutes to say, “Hi, what’s your name; where are you from?” Something so basic can go so far. But we’re living in a different kind of time, though, where people fear everything. Are you ever afraid to approach people? I’m not afraid to approach the refugees, but I do get a lot of judgment from the outside world. We had a really scary experience just a week ago. Someone saw a picture of me with a Muslim person, and they contacted me and said, “You must be part of Al-Qaeda; I’m going to come after you.” It’s scary. It was the first time I felt the need to call the police. What do you tell your kids? That’s what’s so great about just having the women here Monday to Thursday. We have so much fun because we can just be ourselves. We put on Beyoncé and dance like we’re Beyoncé. It doesn’t matter where you’re from; as a woman, you have the same problems. I relate to these women because I get it, we all do. You can show up here crying; that’s okay. Everyone will support you. If you need hugs, you come here. You aren’t alone. We can commiserate with each other. Heartfelt Tidbits and The Welcome Project depend on the support of volunteers. Heartfelt Tidbits is looking to expand its board, with openings for communications, fundraising, legal, and accounting positions. Complete their Contact Us form if interested. The Welcome Project is currently under construction, and they need equipment and material donations to complete their goal of finishing the market and kitchen spaces. Click here to see their current needs, and contact welcomeprojectcincinnati@gmail.com if you are able to help. Handy construction volunteers are always welcome! PayPal donations can be made at the bottom of The Welcome Project’s homepage, and cash and check donations are welcome. All funds raised from Welcome Editions sales go directly to The Welcome Project startup costs. Collect an art piece and help your community at the same time!